Revel in the endless charms of the Paradis Bar Stool Red, a vibrant model with a design set to make a statement. Perfect for adding a splash of colour to your interior, the Paradis Bar Stool is the striking focal point that your bar area is missing. Its red faux leather seat is sensationally supple and includes a mid height backrest, thereby encouraging you to relax. Plus, stitch detailing also makes a subtle focal point. Further to this, the polished chrome column extends from the base with elegance and integrates a footrest alongside a number of additional features. A gas lift mechanism invites you to adjust the seat's position to purpose while 360 degree swivel makes the Paradis an efficient addition to social events. A rubber ring completes the Paradis, encircling the underside of the base and helping to keep your floors in crisp condition. 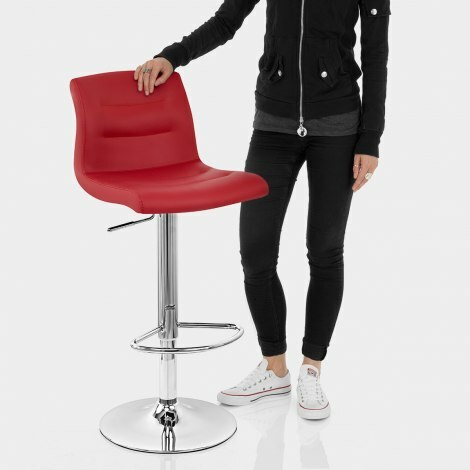 "Excellent bar stool... excellent service"
Quick delivery, well packaged and easy assembly. Very high quality, a real premium product. The pillar box red faux leather is stunning and oozes class. Great product! Very happy with these stools. They look great, are exactly as described. Nice red colour - not too bright. And comfy too. Would recommend. Also delivered quickly and no problems whatsoever. Really please with staff help and service. Tried three different stools and decided on these for colour, pillar box red, comfort and also liked the stitch detailing. Stools were delivered promptly, well packed. Easy to assemble and look great. Would definitely recommend these stools. Excellent service delivered 1 day after ordering and was given an hour time slot so didn't have to wait in. Would definitely recommend and use this company again.